Bufala Mozzarella is a cheese made from the milk of the Italian water buffalo. It is a product of Italy, in the region of Campania and mainly from the provinces of Caserta and Salerno. It is a fresh delicious cheese that is soft and milky. It is typically stored in water to keep it fresh. It is never refrigerated. We have a home in the province of Salerno so there is a lot of Bufala Mozzarella around us. 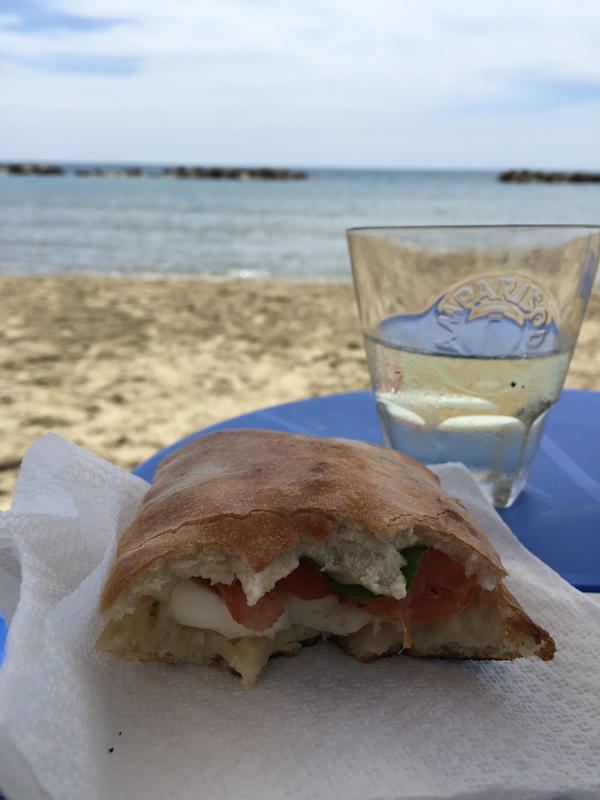 Along the road from the A3 Autostrada to Agropoli there are many places that make it. In every town there is someone who sells it. This is the way mozzarella cheese was meant to be. 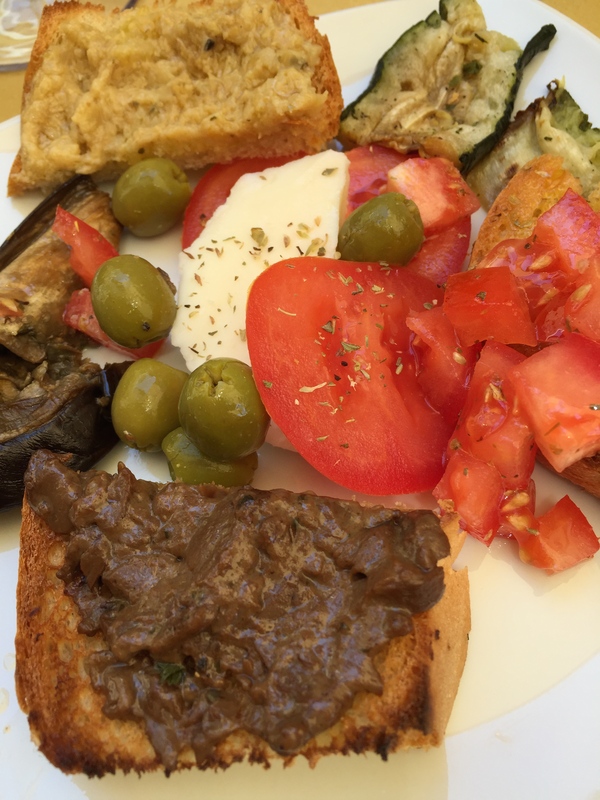 If you are in Campania, try it. Feel the softness of its texture, taste the flavor and enjoy a really great cheese. 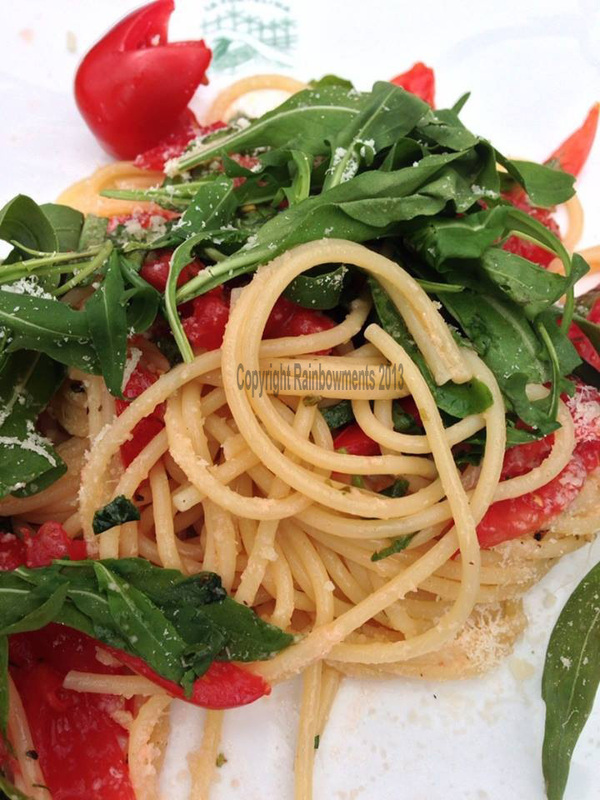 We love it with fresh picked tomatoes and a little olive oil but on a panini (sandwich) it is also great. It is one of the many things we look forward to when we arrive back in this region of Italy. 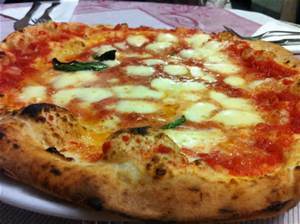 It is the main these of Naples in Campania and is used on pizza in this region. 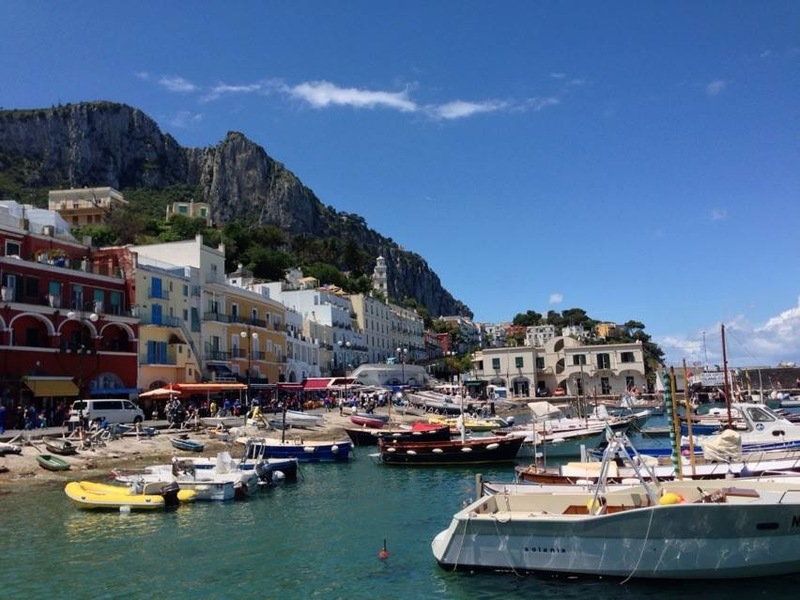 Most tourists take a ferry from Naples, Sorrento or Positano to the Isle of Capri. 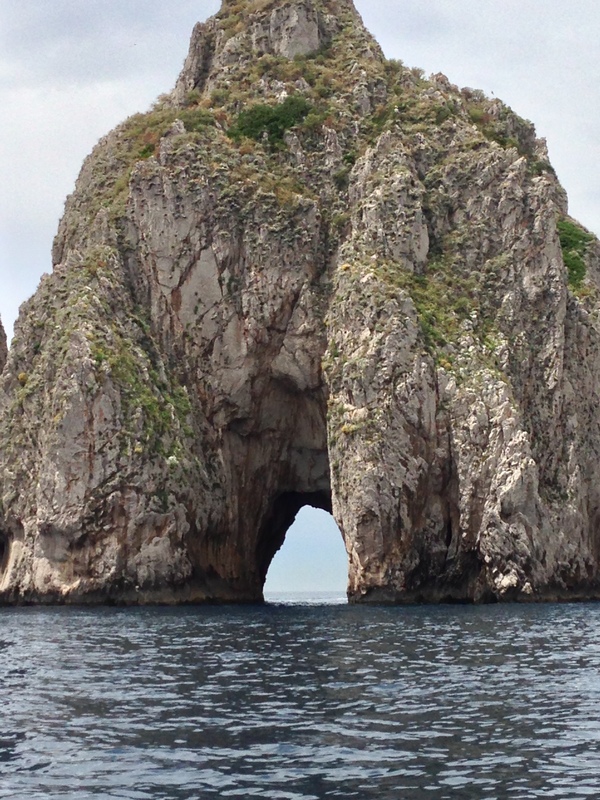 They spend a day mostly waiting to get into the Blue Grotto and then return by ferry in the evening. This is a big mistake! After all these tourists leave, the natives of Capri come out. The streets of Capri City are much less crowded. You can enjoy your stroll without being knocked about by tourists. The island and the city become magical. The lighting is perfect for photographers. Restaurants gear up for the evening meal. Bars await customers looking for a drink. 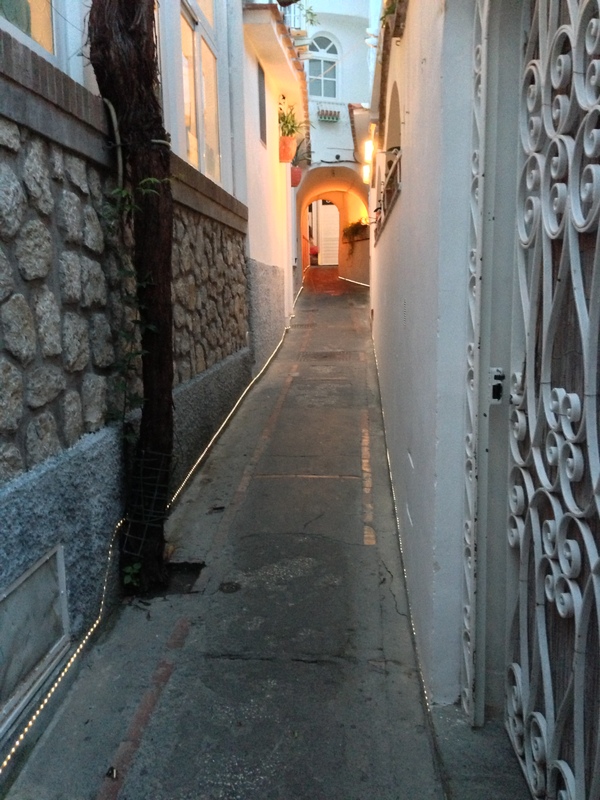 We had found a few small (alley like) streets off the main piazza. They had stores and restaurants. One store made custom sandals. You are measured one day and can pick up your shoes the next day. There were also small grocery stores. We decided to spend one evening eating at our hotel. We were able to get a bottle of wine, cheese, bread, olives and chocolate at one such shop. Our hotel with the fabulous view became a romantic restaurant for the evening. We dined on our private balcony overlooking Capri and the sea. We tend not to like places were a lot of tourists gather. But these small streets were a real find. They are cooler in the summer, have fewer people on them and offer small cheaper shops that normally do not cater to the tourists. It would seem that tourists like to stick to the main piazza and streets. They shy away from small streets. Their loss! Go to Capri and be romantic. Stay an evening or more. Make the island your island. If it is a special occasion, spend the extra money and stay at Villa Brunella. You pay once but will remember it for the rest of your life. Low Speed – Departs from Calata Porta di Massa Napoli, duration 1 hour 20 minutes and costs about 13 Euros (higher in summer). 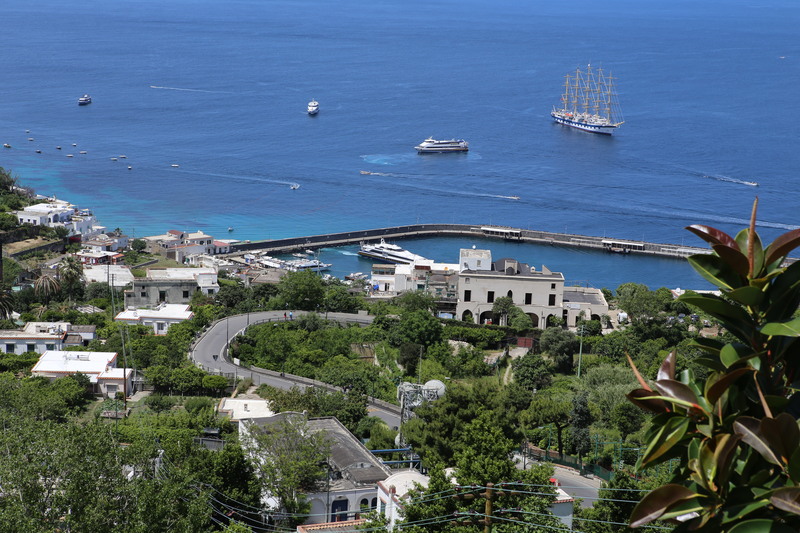 From the time you board your ferry until you leave Capri, it is a magical experience and a memory maker. 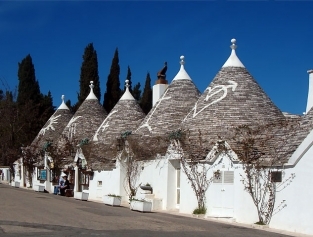 This is a romantic island that offers beaches, museums, two wonderful small towns and unlimited sightseeing. The famous Blue Grotto is here but you will wait to get in especially in summer months. Typically you take a boat from one of the two marinas to the blue grotto and transfer into a smaller row-boat that will take you into the grotto. Then after exiting you transfer back onto your original boat. Jo and I had just come off a 8 hour overnight flight with only an hour or two of sleep from Philadelphia to Rome and a 3 hour drive south to Naples. We were tired and just starting our day in Italy. As we boarded the high-speed ferry, I felt my adrenaline surge. This was very exciting and romantic. Soon we were out of the Bay of Naples and into the Tyrennian Sea. 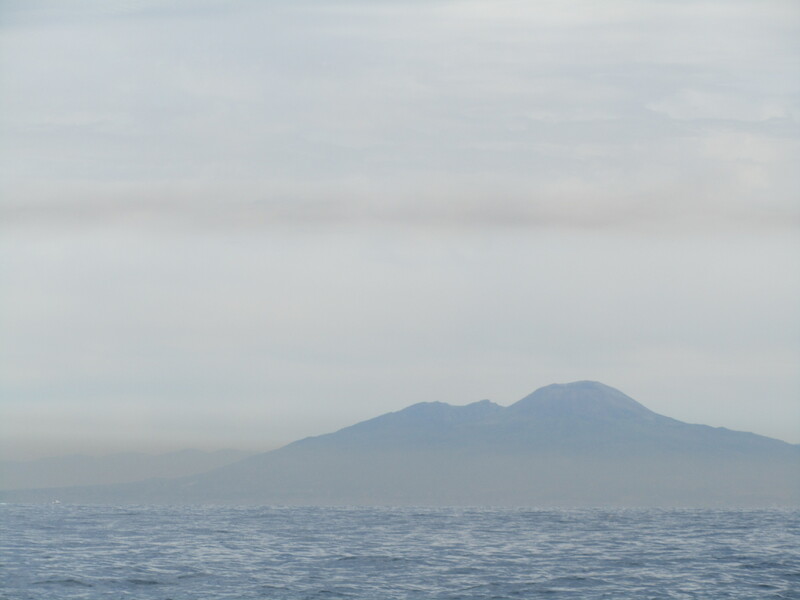 Almost immediately we could see a dot of land ahead that was Capri. Soon our ferry pulled into the large marina (Marina Grande) on Capri Island. Surrounded by pleasure yachts and other ferries we docked. As we disembarked the ferry with two giant suitcases we were met by young men grabbing our suitcases and asking what hotel we were staying at. This could have been alarming but we knew what to expect here. 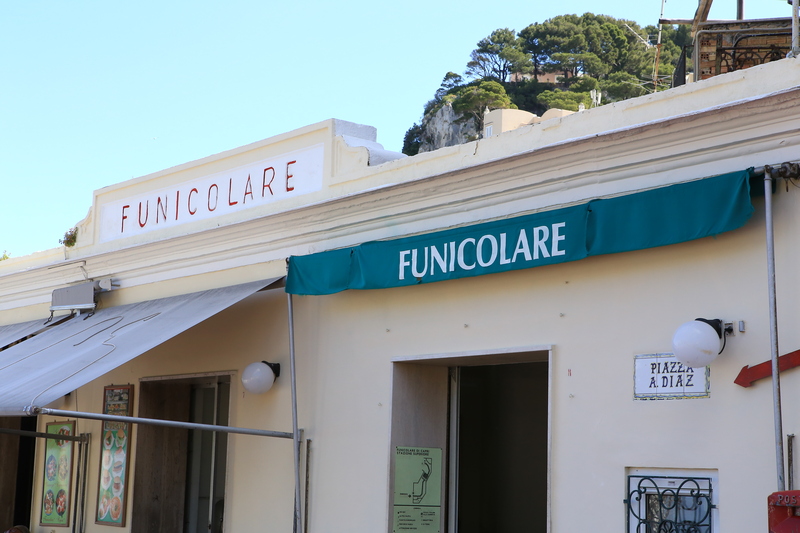 Suitcases are delivered to your hotel quickly on small golf cart like vehicles that run around the pedestrian paths of Capri. After leaving our bags with the gentleman at the marina, we were free to move about. 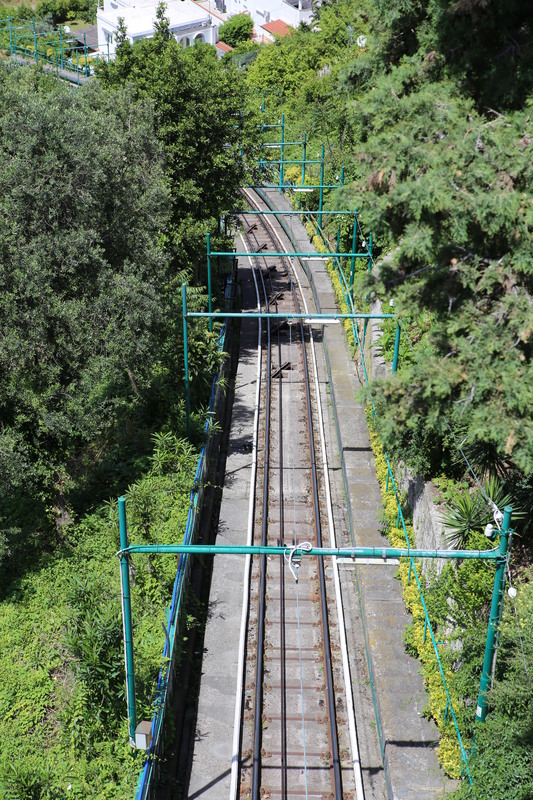 We first went to the funicular stop at the marina, bought two tickets and boarded the next train. 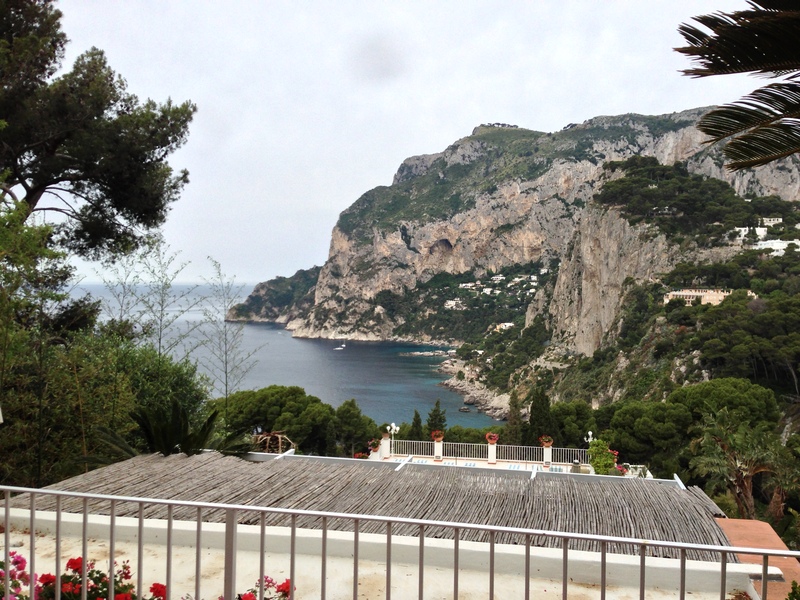 We were given views on the steep ascent up to the city of Capri. At the top we could see the marina we arrived in far below. Beautiful homes hung precariously on cliffs all around us. We were here in Capri and no longer tired. We found a pathway that led from the piazza to our hotel. With a few wrong turns we were finally at Villa Brunella our hotel. Each room is on its own floor as the hotel clings to the side of a cliff. There are lots of steps here! We were ready and very excited. My next BLOG will explore the city of Capri and this wonderful hotel.